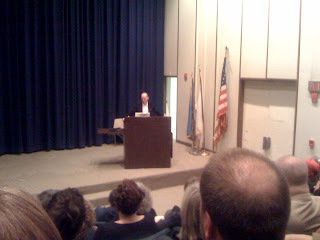 Here's Erik, last night at the annual William A. Dwiggins Lecture at the Boston Public Library. He got about 30 second in and the fire alarm went off. 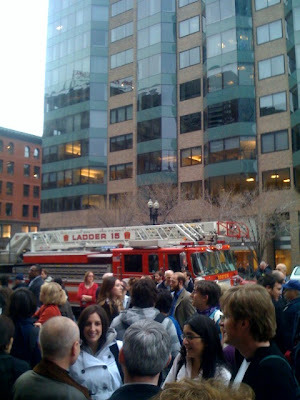 So the entire building was evacuated for only about 5 minutes and we went back in. The presentation was excellent (he used keynote of course). He talked about his history, his studios now, great typography, the complexity of creating a typeface and the team of people he has to do all the work for him after he designs the first few characters (must be nice). He talked about creating custom exclusive typeface families for clients and the complexity of creating 4000 characters in 4 different languages. Spiekermann went into detail about the Bosch brand, the amazing work they've done for them, the beautiful typeface Bosch, a massive san serif family including a custom serif body copy font. He also hit on designing more members of the type family than the client initially asks for, and then when they ask, his team has them ready (but of course asks the client for more time and money anyway, haha). It was an inspirational talk on design and typography and what it's like to be a self proclaimed Information Architect. Spiekermann's galloping german accented diction was as entertaining as it was educational. It was a great presentation and I can't wait to use Meta again, thanks Erik!